Continuing our celebration of Pope Benedict's fifth anniversary as Supreme Pontiff, we conclude our three-part reflection with some thoughts on Pope Benedict's exercise of the munus regendi. The task of the Bishop of Rome is to "confirm the brethren" in the Faith, building up the unity of the Body of Christ through fraternal and paternal charity. In this regard, the quest for ecclesial unity is of primary importance. 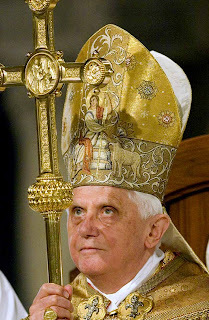 Pope Benedict has made ecumenism a top priority of his pontificate, reaching out to the Lefebvrists with Summorum Pontificum and reaching out to the Anglicans with Anglicanorum coetibus. In these immense gestures of fraternal generosity, the Holy Father has made it very easy for these separated brethren to receive the gift of Catholic unity. Pope Benedict has also distinguished himself in his efforts to clean up the "filth" in the Church (as he put it) with regards to the clerical sexual-abuse scandals in Europe. His Letter to the Church in Ireland is particularly poignant in this regard, as is his disciplinary action towards the Legionaries of Christ. Despite attempts to besmirch his name, Pope Benedict remains above reproach in the fight against this contemporary scourge. These and all the efforts of the Holy Father in his governance of the Church are animated primarily by his personal holiness and love for the Church. In this, he is also a Pope who leads more by example than by fiat. It will be important going forward for Catholics, attuned to his governance of the Church, to pay close attention to that example, especially as regards the celebration of the Sacred Liturgy.